The BBC says it has left Jeremy Clarkson "in no doubt about how seriously" it takes allegations he used racist language while filming Top Gear. Clarkson has apologised and asked for forgiveness after a clip of him reciting the nursery rhyme Eeny, Meeny, Miny, Moe was published by the Mirror. Although he mumbles the offending word, the presenter clearly begins by saying the letter "n". Responding to the row, the BBC issued a strongly-worded statement. How often is he going to keep apologising for these things? "Jeremy Clarkson has set out the background to this regrettable episode. We have made it absolutely clear to him the standards the BBC expects on air and off. 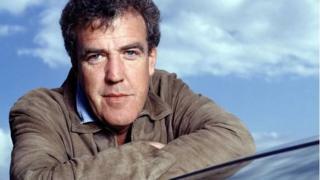 Clarkson initially denied using the racist term, telling his 3.3 million Twitter followers: "I did not use the N-word. Never use it. The Mirror has gone way too far this time." But the newspaper responded by posting a clip of the incident - which was filmed in 2012 and never broadcast. On Thursday night, Clarkson released a video statement "begging forgiveness" for the error. This time, he admitted he had appeared to "mumble" the offensive word despite attempting not to. "I was mortified by this, horrified. It was a word I loathe." "I did everything in my power to ensure that that word did not get in the programme that was transmitted." Editor of The Voice newspaper George Ruddock said that, if it was clear Clarkson had used the offensive term, "the BBC should take some action". "If you were in a normal workplace and that was used, it would certainly call for disciplinary action," he told BBC Radio 5 live. "How often is he going to keep apologising for these things?" Labour MP Jim Sheridan, who sits on Parliament's culture, media and sport committee, also noted this was not Clarkson's first offence, and called for him to be sacked. He said: "Already he's insulted nations, he's insulted disabled persons, he's insulted people with mental illness. Every time he apologises, and every time the BBC say that they've told him to cut it out, and he's not doing it." "His whole career is littered with apologies, and I doubt very much if indeed he is sorry." Downing Street condemned any use of the word, saying that David Cameron - a friend of Clarkson's - would "certainly not" use it. The prime minister felt it was "absolutely right that there has been an apology," his spokesman said. But he refused to comment on whether Clarkson should lose his job, saying: "His view is that in terms of actions and the like, that's for the BBC". Former BBC chairman Sir Christopher Bland also rebutted calls for Clarkson to be sacked, despite acknowledging "a serious error of judgment". "He shouldn't be sacked. I tell you who should be sacked, and that's the person who released the clip to the Daily Mirror in order to give the whole thing a wider circulation than it deserved". "It's a word that wasn't broadcast. He's apologised and, really, that should be the end of the matter". "Do you think he's a racist? I suspect not. I think he's sloppy in his use of language." On Friday, Clarkson spoke to The Sun, where he writes a column, and attempted to explain the incident. "I wish to God my attempts to cover up that word were better," he said. "I was simply mumbling - saying 'ner ner' or something similar. Anything but the n-word. "It was my mistake and I apologise for not covering it up. But if you look closely at the footage, you can see what I'm trying to do." He also showed the newspaper production notes for the Top Gear episode, in which he attempted to have the offensive word removed. The 54-year-old told producers: "I didn't use the N-word here but I've just listened through my headphones and it sounds like I did. Although the clip was never broadcast on the BBC Two show, the corporation said it had received more than 300 complaints following recent media coverage. It is not the first time the Top Gear presenter has been accused of racism. The BBC apologised in 2011, after an episode in which co-presenter Richard Hammond called Mexicans "feckless [and] flatulent" and Clarkson joked they would not receive complaints because the Mexican ambassador would be asleep. Apologies were also made for an episode broadcast in March, in which Clarkson used the word "slope" as an Asian man crossed a newly built bridge over the River Kwai in Thailand. The use of the word - which is a derogatory term for people of Asian descent - led to complaints and the threat of legal action from Equal Justice, a law firm specialising in discrimination cases.